Boom. He wakes up 24 hours earlier, just as he’s being turned over by the MPs to his new combat unit. Damned if his experiences don’t repeat themselves exactly. Only this time he lives a few seconds longer because he knows what’s coming. Still, he dies, and wakes up at the very same moment 24 hours earlier. This cycle is repeated indefinitely. Evidently the alien blood in which Cage was soaked has given him the ability to time jump. Every time he dies he returns to that same starting point back in England. 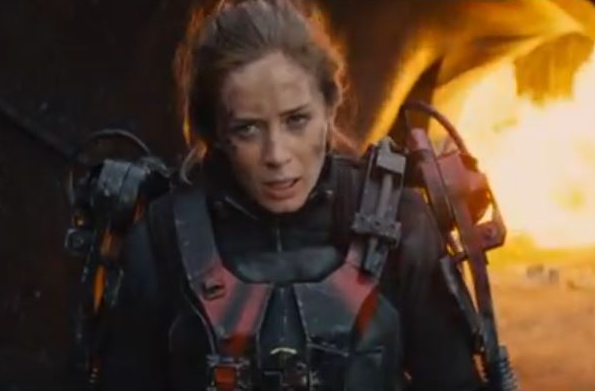 This is explained to Cage – and to us – by Rita Vrataski (Emily Blunt), a woman warrior who has achieved poster-girl fame for her combat exploits. Rita – who battles the Mimics with a curious weapon that looks like a high-tech cricket bat — explains that she had the same thing happen to her, but that she lost the time-jumping ability when she was given a transfusion of human blood. Now she will train Cage in how to fight and survive against the Mimics. Together they will go through dozens of lives (and deaths) until they discover the location of the alien hive and destroy it. Every time they hit a dead end, every time they’re cornered or unable to advance, Rita shoots Cage (though he will on occasion argue for a few more minutes of life). And, presto, they’re back in England starting the story all over again. 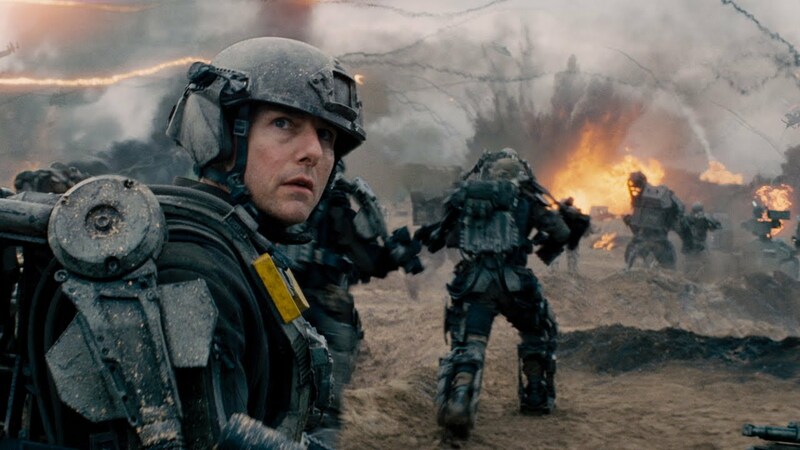 Unlike the classic Bill Murray comedy “Groundhog Day,” which had the same premise of a guy reliving the same day over and over until he finally “gets it right,” “The Edge of Tomorrow” ignores the mind-bending implications of repeating the same 24 hours – with incremental variations – for what amounts to hundreds of days or perhaps an entire eternity. The screenplay by Christopher McQuarrie, Jez Butterworth, and John-Henry Butterworth is about motion and action. They have little time for existential musings when in each successive life William is moving ever closer to a final showdown with the Mimic queen. It’s nice to see Cruise in non-heroic mode (though of course through repeated lives his Cage does achieve heroic status). Blunt is effective as the lethal Rita. There are a nice supporting perfs from Bill Paxton and Noah Taylor. But the main attraction remains crashbangboom.